Develop your skills and expertise, connect with clinical research nurse peers, and share knowledge and experience of clinical cancer trials and treatments. Professional development and networking support for clinical research nurses working on cancer trials. 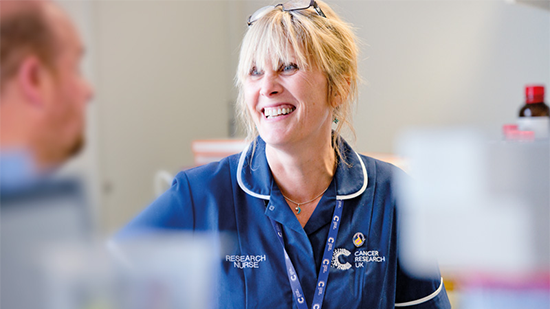 Find out how we support all clinical research nurses on cancer trials. News and resources to help build your knowledge and skills in cancer research, trials and treatments. Connect with other clinical research nurses and share your experience of working on cancer trials. Explore our range of free informational resources to use with your patients. Useful resources and information for the wider clinical research team working on cancer trials. Discover the latest info and evidence from cancer clinical trials, and hear from those working on them, as we feature current trials and translational research across the UK.